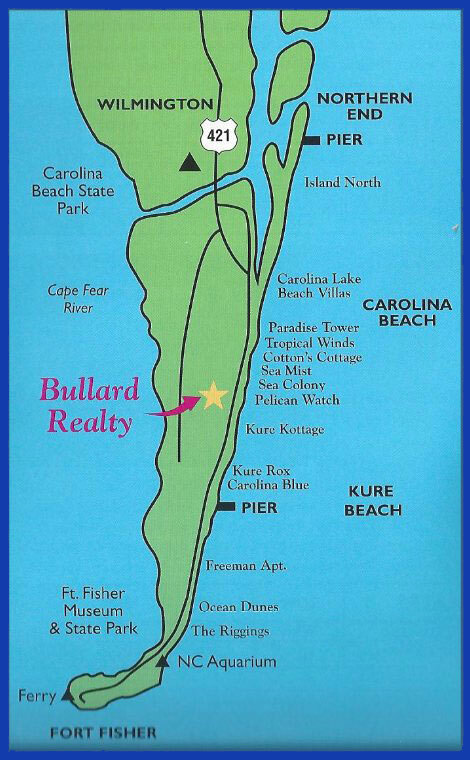 Scenic Pleasure Island is awaiting your next visit and Bullard Realty is ready to make your North Carolina vacation a reality! Pleasure Island plays host to a year-round variety of activities and special events. It definitely has something for vacationers of all ages. Historic Wilmington, our state's premier port city, is located only minutes away. All this and more, while surrounded by the Atlantic Ocean, the Intracoastal Waterway and the Cape Fear River. Within minutes of an international airport, a zoo and area gold courses. Proud to host North Carolina's largest aquarium.